We welcome this review by guest contributor Martin Fraenkel, from the Royal Festival Hall in London. Maurizio Pollini’s only 2016 London piano recital took place on Wednesday at the Royal Festival Hall. Originally scheduled a week earlier, the concert was postponed due to the performer's ill health. Once, Pollini's commanding stage presence demanded respect and expectation, quite apart from the unrelenting brilliance of his technique. Now appearing older than his 74 years, he rather shuffled onto the stage, slightly stooped, and the impact was not quite the same. The sense that time is catching up with the great postwar generation of European musicians was heightened by Pollini’s unscheduled decision to start the concert with Schoenberg’s Six Little Piano Pieces, op. 19. Written following the death of Schoenberg’s mentor, Mahler, Pollini dedicated them to the memory of the late Pierre Boulez. Stark, essential, and lasting in total five minutes, the effect was profound. The scheduled Schumann Allegro, op. 8, and Fantasie, op. 17, filled the first half. The impact of this passionate romanticism seemed strangely misplaced after the Schoenberg. Pollini’s well-drawn melodic lines provided some tender moments, especially in the third movement of the Fantasie. The at-times fiendishly difficult fast passages, however, rather revealed the declining powers of Pollini’s finger work. The sense that he was straining to the limit was only emphasized by his rather audible singing which broke out intermittently. One began to fear what might happen in the Fantasie’s second movement, described in Harriet Smith’s program note as a “real graveyard for pianists” and not for the “faint of heart.” In the event, Pollini hung on gamely, if no longer imperiously. The second half was dedicated to Chopin, with whom Pollini has always been closely associated. And indeed, the struggles of the first half gave way to deep exploration of the highest order. A steady rendering of the op. 60 Barcarolle was followed by the evening’s highlight, the op. 55 nocturnes. 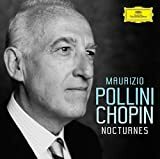 The link between Schoenberg and Chopin is slender indeed, but Pollini again seemed most at ease seeking out the inner emotion which lurks beneath the outward simplicity of structure. This was followed by an intense Polonaise-Fantasie in A-flat major and an assured performance of the Scherzo No. 3, op. 39. Two further Chopin encores ensued. With many members of London’s burgeoning expatriate Italian population among them, the audience was by now on its feet. One rather felt that this was a mark of a nation’s pride and gratitude, not so much for the evening but for a great career perhaps nearing its end.